We’ve finally added a Draw Something Cheat page to the site. It took us some extra time because we wanted to do it right. A lot of other sites use the Words With Friends Dictionary or Scrabble Dicitonary, which means you get hundreds of results that aren’t even legal for play in the game. There are less than 3000 words in the Draw Something Dictionary. Compare that to around 171,000 in Words With Friends and over 300,000 in Scrabble. Include those and you obviously have an un-usable site. If you download mobile apps on a semi-regular basis, the chances of you hearing about or playing Draw Something are pretty high. For those of you who have never heard of this game, it’s very simple yet super addictive. 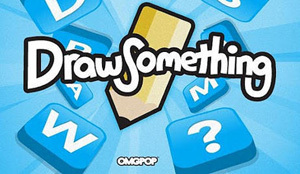 Draw Something is a game, similar to Pictionary, in that you are given 3 clues to choose from. Each clue has a different difficulty level and if successfully guessed correctly, garners different amounts of coins. The brilliance of this game is that what you perceive, initially, as your opponent, is actually your PARTNER. Your objective is to draw the clue using pictures. Their objective is to guess your clue. Once that turn is complete, you switch roles. This app is on a major upswing, having already surpassed the 50 million download mark. Draw Something has been sitting in the #1 spot for over a month now and Zynga decided to purchase them, making a nice addition to their portfolio. Draw Something has just released a new update to their game that has some people talking. Daily users have been clamoring for a wide variety of features, some of which have been implemented into the game. For instance, mimicking their own most popular app, Words With Friends, there is now the ability to chat with your game partner and post comments, while you are drawing. So if your drawing skills are horrible, like mine, you can laugh about it with your friends. The most popular new feature has to be the undo button. How many times have you tried to erase a few lines, only to totally screw up your masterpiece? This ‘Undo’ button allows you to back up to where you were before you drew the wrong thing. This will save lots of time and will serve as a convenient tool. Other new features include a ‘refresh’ button that is similar to what you see on Twitter and Facebook. Instantly refreshing the game is a nice touch and helpful for players who want up-to-the-minute action. Push notifications have also been introduced. These will let you know when your partner has played their turn and keep the games flowing. The downside to the update, is that the ads being serviced on the FREE version are now longer. This is not a big deal for those that enjoy the Ad-Free version. After all, they are trying to monetize. If you really enjoy the game, you should consider upgrading to the Premium version. All of these new features bring even more convenience and fun to Draw Something fans. this game is great but really need the cheats page cos sometimes my partners drawings are very hard to guess.